I based it on this beauty by Angela Armstrong that I found on Pinterest, with a few extra rounds as I wanted it bigger. Mum's now got it, after a not-so-subtle 'One in that colour would really go in my room!' I'll make another for the dining table, perhaps in a softer pink, better suited to the Cath K theme. 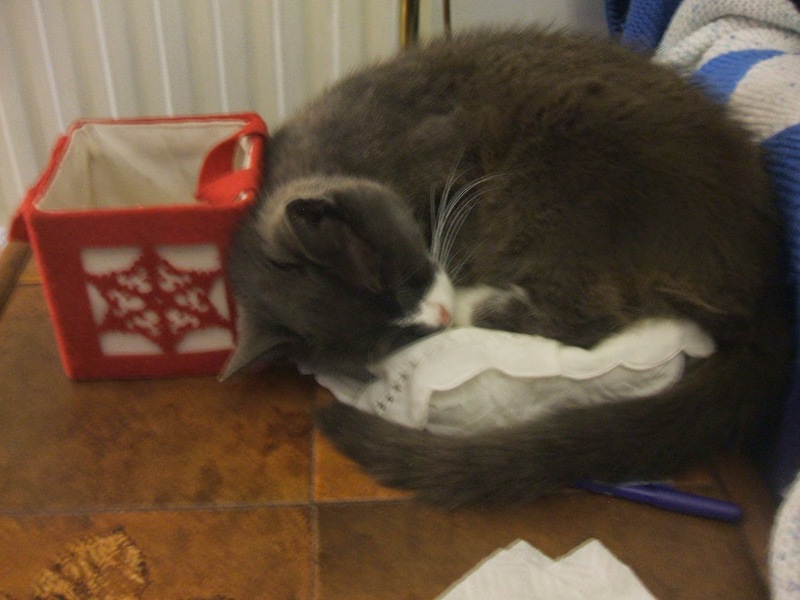 Meantime, Rosie still chooses strange nests - why would she lie on a tissue box rather than her own cushion, right next to it?! 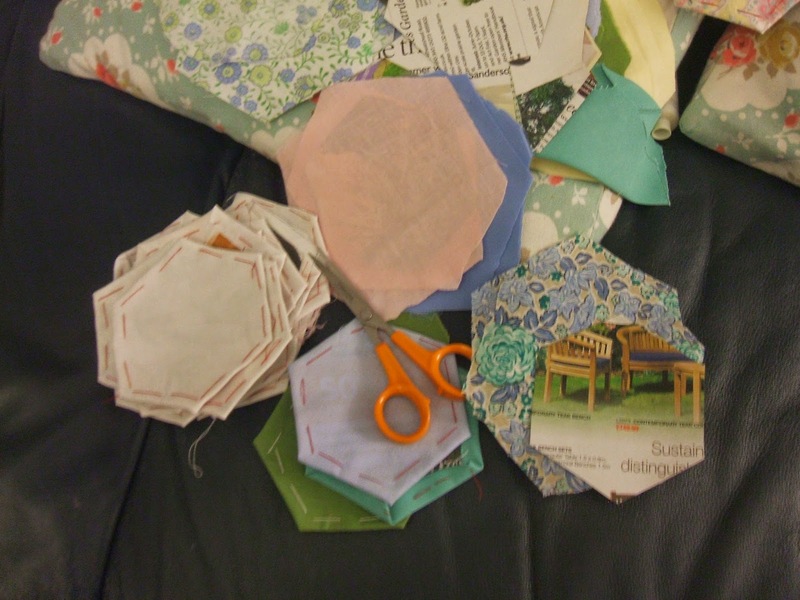 and sofa crafting continues, with the hexie quilt growing nicely. I hope to catch up with all you lovelies, at Julia's for a virtual cuppa, over the next couple of days. 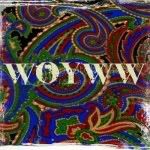 If you don't know WOYWW, click here for a wonderful, whistle-stop crafty world tour. Your crochet is beautiful. Something for me to aspire to, having just grasped a few stitches at the weekend! Well done - the finished doily is beautiful. The car washing made me laugh! Only cos I can just see my lads doing exactly the same thing!! 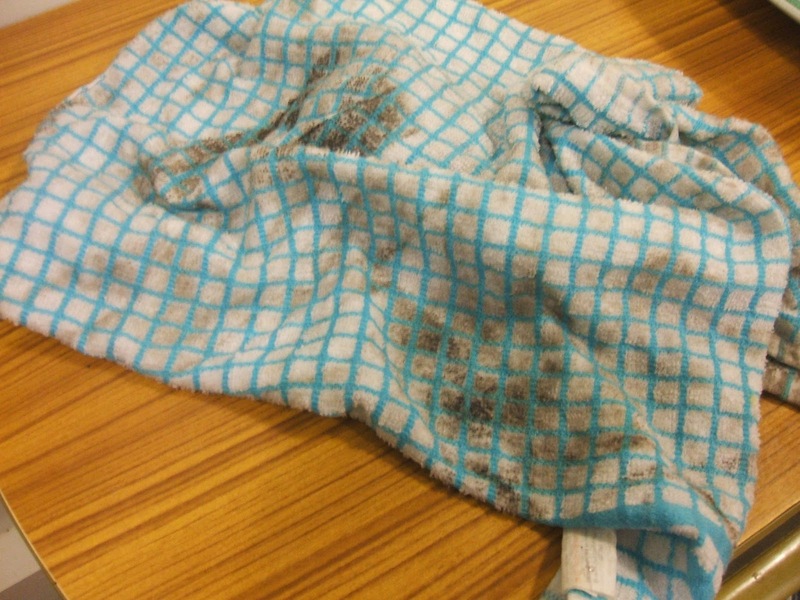 Still, a brand new tea towel...sigh... Wouldn't have been so bad if it was a few months old eh? Love that in your face pink crochet...you have a very even finish. No wonder your mum pinched it! Cats being silly is one of the best joys of life! When I work in my garden at the Steam Trains the 'yard' cat loves to come and sit under the lavender and watch me - in between naps of course! I trimmed the lavender yesterday and could feel the 'stare' in my back!!!! Your sweet kitty is so beautiful and you can just tell she's so soft!!! Great job on the doily, and the quilt is coming along too! Have fun!!! Hi, love the finished doily it's beautiful. To him it's just a bit of cloth Lol! 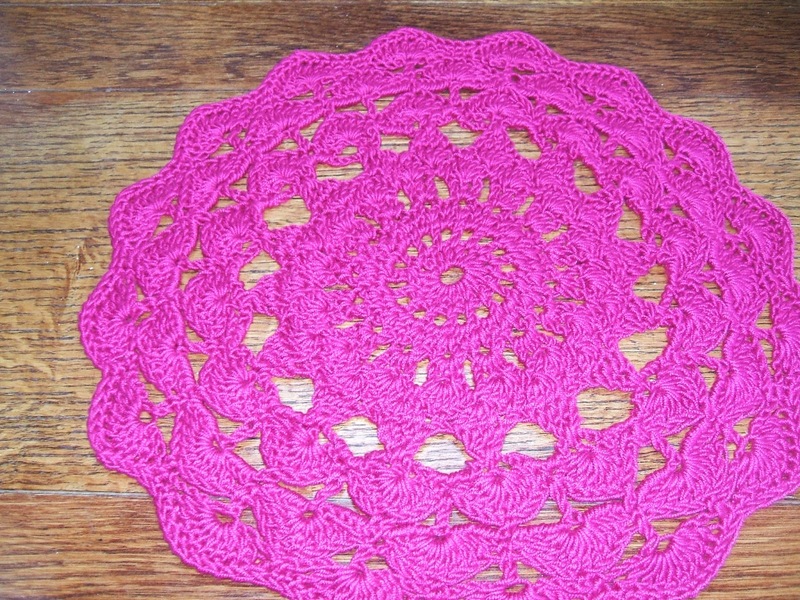 That is a very pink gorgeous doily! Should be quite difficult to misplace. 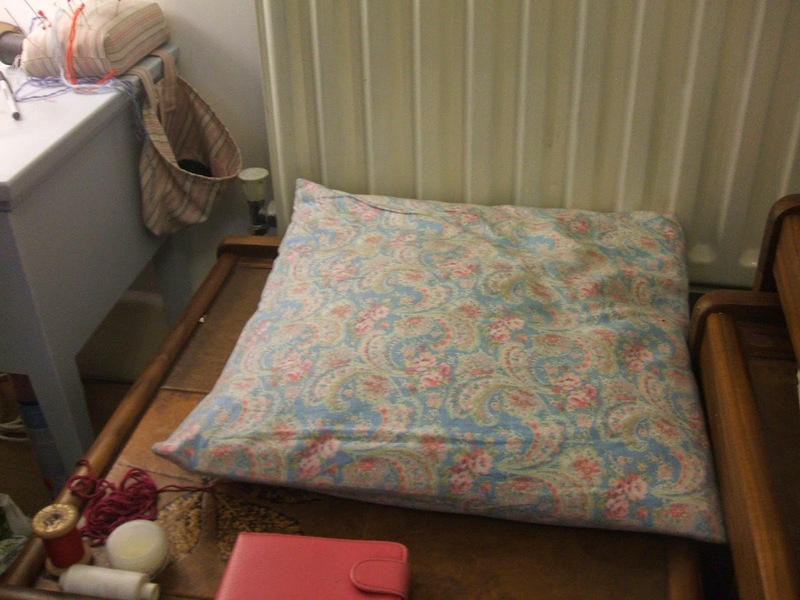 Love Rosie's choices of beds. What a hoot! And I remember our son "forgetting" where the rag pile is in preference to something more handy. Happy WOYWW! Hi Chris, Have you got one of those males too? Just don't get things, and it is no use explaining because they still don't get it. Love the pink doily, not quite my colour but love the crochet work in it. You are getting on well with the quilting, I might start one day. Thanks for popping by my desk and nice remarks about cards, next week I'll show today's Christmas card. I guess the hexagon quilt is a long term project :) ? Hi Chris. Thanks for calling by at mine yesterday. I'm catching up with my visits this morning because I had another twinnie fun day yesterday so didn't get a lot of time to call by. I really love your crocheted mat...such a pretty pink. Your cat sleeps in some funny places!!!!! Rosie is so funny! Typical cat. They always do their own thing, don't they! We can put ours on the bed and they jump straight off again, but two minutes later they'll be back, but this time it's OK because it was their idea lol! Using a tea towel for the car! Typical male thing - they would say practical. Your crochet is so lovely, such a cool colour! Aren't cats interesting. I have one that crawls into any box or basket and the smaller the better! The doily is very pretty! Having three sons, well, I completely understand the first part of your post. And you know how it goes--Miss Rosie is a cat, and that's pretty much all the excuse she needs for sleeping wherever she wants. Our Maggie is at the back door right now, mrrreorrwing to be let in with a rat she caught . . .
That doily is gorgeous, Chrysalis--definitely not my grandma's doily, no ma'am! One can never have too many tea towels! haha. What a cute post and the doily is gorgeous! With 2 college age girls of my own, I got a kick at your son's dish towel mishap. 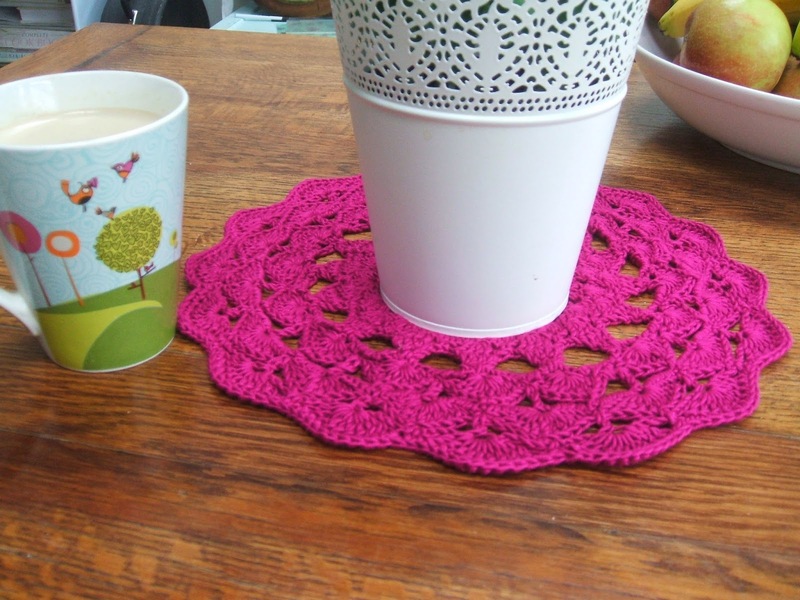 I love the color of your crochet coaster. Blessings! Great post! You've been busy for sure. Love your sleeping cat! I can see why your dear Mum dropped her subtle hint - it's a beautiful piece of Crochet, and a fab colour. Lovely pattern. I love the tea towel story....just take heart from the fact that we all have a version...you are not alone!! Lovely little doily. Bright and cheerful! It would cheer up any cup of tea or coffee. Your hexaquilt is really coming on isn't it It's looking very promising.